If you have ever been to the Napa Valley for the experience of wine tasting, you know how this scene goes. You drive down one of two main roads through the area and every few miles you find a winery where you can stop in, taste the wines, and perhaps take a tour. Even though it’s supposed to be wine tasting not drinking, you can’t really plan to hit more than two or three wineries in a day. First of all, after a while your tastebuds give out and all wines taste the same. Secondly, and maybe more importantly, you won’t be able to make it back to your hotel safely unless you have a designated driver. Over the years, we have made several trips to Napa, Sonoma, and the Russian River areas and now, of course, they are right in our backyard. We are quite familiar with the experience and have truthfully had our “fill” of it. While we enjoyed these various degustations, as they’re called in France, we discovered that the wine we especially liked at the winery (and, in some cases, put out some serious money for) did not impress us nearly as much once we got it home. I’ve come to the conclusion that the vintners and sommeliers have done a good job of learning how to promote their business so as to convince you that their wine is the best. We really satisfied our French wine tasting desires during our stay in Beaune, the heart of Burgundy wine country, at Patriarche et Fils where, by the way, we did not buy any wine. Since, as we’ve mentioned in previous posts, the French standard for wine is so high, we have been able to find an excellent variety of local area wines by simply shopping for them at the grocery store in each place we have stayed. We simply look for wines that have earned the gold medal distinction. Why not chose a wine that has received France’s own highest award? So this week when we landed smack dab in the middle of the Bordeaux wine country surrounded by vineyards in every direction, we were not motivated to add visiting the chateaus to our “to do” list. In fact, this week we have had no “to do” list at all. Our only desire has been to kick back and relax. Today, however, we thought we should venture out for at least a few hours and check out our environment. I scoured the many brochures previous guests have left behind, read through my digital guidebooks, and perused the Internet. 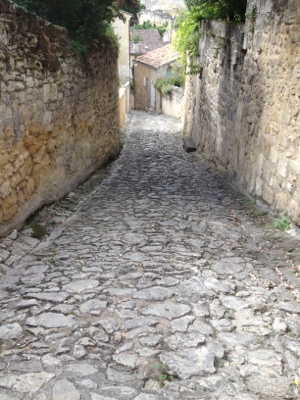 Finally I decided on a drive to Saint Émilion, only about 30 minutes away. We hear a lot about Saint Émilion wines in the U.S. but they’re not commonly stocked in our stores. As we progressed on our journey, we found ourselves bombarded by one chateau after another so close together on the narrow, winding road that it would cause an accident if you decided to stop and visit one. That’s when I commented, “This is like Napa on steroids!” It was really crazy to see the endless number of wineries. In fact, there are 13,000 wine producers in this area, the biggest concentration of wine-producing vineyards in the world. Since it’s summer and the height of the tourist season, a few of these places were actually advertising that they were open for tasting, but in reality, for most of them, you have to make an appointment because most vineyards don’t have permanent staff to accommodate tourists. 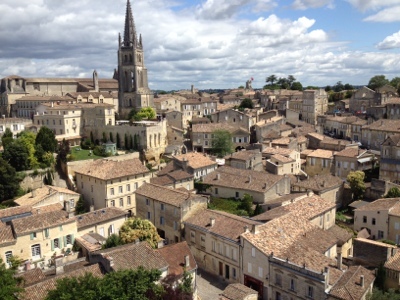 Saint-Émilion is on the list of UNESCO’s World Heritage sites. Last year, the mayor was forced to sell off one of its historical monuments, the Cordeliers cloisters, in order to pay off some debts. The town has a debt load four times greater than the average French town of the same size despite tax revenues which are 73 per cent higher. Some of this is attributed to poor management, but the town council claims that the sale was necessary to maintain the historical sites. The cloisters sold for 750,000€ (about $930,000) after the town spent 570,000€ ($698,000) to restore it. The new owner… head of a sparkling wine company, of course, which is housed in the facility. As usual, each of our adventures adds to our understanding of France — the people, the country, and its history. This one was no exception.